Can Russia break the India-China deadlock? Russia’s mending fences approach with Beijing can be the template for solving India’s border problem with China but first New Delhi has to get over its colonial hangover. It would be too much to expect India’s political class to be conversant with Clausewitz’s 1832 book On War, from which the above lines have been quoted. For, as witnessed over the past decades, India seems to be in no tearing hurry to settle its disputes with China. Bedevilling relations is India’s colonial inheritance, the McMahon Line, which New Delhi treats as gospel but in reality is an illegitimate child of the Simla Conference of 1913. Rightly, Beijing refuses to even look at this phoney demarcation. There is a parallel to this Himalayan standoff – the 300 year old Russia-China border dispute, which once seemed equally intractable. The 4380 km land border, the world’s longest, had been dubious since Tsarist times. In 1912 a peasant named Sergey Tarabarov settled on an island in the Amur River, giving it his name. In subsequent decades following the ideological split between the communist allies, the border became a flashpoint with 658,000 Soviet soldiers facing 800,000 Chinese troops. In March 1969 skirmishes turned into a full blown clash that claimed 58 lives on the Soviet side and hundreds on the Chinese side. It took a complete repudiation of the Tsarist colonial legacy by presidents Mikhail Gorbachev and Boris Yeltsin to affect a breakthrough. Emotions were parked aside, and one of the key pieces of territory that changed hands was Tarabarov Island. While ratifying the agreement in 2004, Russian President Vladimir Putin said compromises were necessary to find a solution. China’s South China Sea moves: part of a bigger gameplan? India’s leaders, however, are sentimentally attached to territory illegally – and only notionally – bequeathed to it after the 1913 Simla Conference convoked by the British. The participants in that ill-fated meeting included the Tibetans, who attended willingly, and the Chinese who were under duress because of civil war in their country. This is the dope on Tibet – the collapse of central Chinese rule allowed it to become a de facto independent country in 1912. The problem was the British wanted to formalise Lhasa’s new status. But despite all sorts of pressures on them, the Chinese refused to sign the ‘accord’. So what the British officials Henry McMahon and Olaf Caroe did was they falsified the records through a crude forgery of both the diplomatic notes as well as the Aitchison’s Treaties – a compilation of treaties and agreements executed in imperial India. This forgery is India’s colonial legacy. The McMahon Line is pretty much British snake oil that India peddled for decades. It was Karunakar Gupta, an Indian scholar at Cambridge, who discovered this forgery. In his paper, The McMahon Line 1911–45: The British Legacy, he writes that in 1929, the original 14th volume of Aitchison's Treaties showed the Simla Conference had not discussed the McMahon Line at all. Like Stalin before him, Chinese strongman Mao Zedong suspected independent India’s leaders were neo-colonist agents of their former British rulers. For instance, they could not fathom why despite Britain’s repressive policies in India, Nehru continued to rely on British officials and sought their advice. (As it turned out Mao and Stalin were right – Nehru followed Louis Mountbatten’s advice and took Kashmir to the UN.) Keep in mind that the fiercely proud Chinese don’t even recognise British titles such as “Sir” or “Lord” so they were appalled when India actively sought membership of the Commonwealth – after independence. Also, the Chinese leaders were left scratching their heads why free India retained street and place names that honoured colonial rulers. The Chinese are a pragmatic people but by their very nature communist regimes are secretive, blinded by ideology and prone to knee-jerk reactions, and so they came to the conclusion that Indians were not really free but were under the thumb of the Anglo-Americans. Interestingly, it was only in 1955 when Russia’s Nikolai Bulganin visited India – eight years after the British retreated – that Delhi street names with an imperial flavour were changed; for instance, Queensway was renamed Janpath (People’s Way) and Kingsway became Rajpath. As Russia ultimately came around, the Chinese position is changing too encouraged by India’s Look East policy which ties in with China’s new Look West approach. According to Wang Jisi, the dean of the School of International Studies, Peking University, after decades of trying to contain India and having failed, China now wants a reset with India. Three factors are transforming the India-China relationship. One, trade is booming, with the Federation of Indian Export Organisations targeting $100 billion in exports to China by 2018. In six years, total two-way trade could cross $250 billion – no small beer especially when Beijing’s Western markets are rapidly shrinking. Second, the American armada sailing into the western Pacific has muddled the security scenario for China. The heavily armed US ships with bases in Guam and Australia now pose a real threat to the Chinese navy. America is also stirring up things in the South China Sea by siding with smaller nations in their littoral disputes with China. Under these circumstances, the last thing Beijing wants is to take on a resurgent – and heavily armed – India. Finally, Islamic terrorism is visiting China’s Muslim majority Xinjiang province. The communists are realising belatedly that the Faustian bargain they struck with Pakistan is coming to haunt them. “We have to fend off extreme Islamic terrorism from getting into China from Pakistan," says Wang. Consequently, they are now betting on India rather than Pakistan. Compromises are the only way out of the deadlock. In fact, for decades Beijing was willing to recognise Arunachal Pradesh as Indian territory, provided New Delhi gave up its claim on Chinese-controlled Aksai Chin. However, India’s leaders stuck to the tired old “not an inch” stance, evocative of the stubbornness shown by the Kaurava brothers in the Mahabharata. The ice may finally be melting though. In April this year, retired army general J.J. Singh, the governor of Arunchal Pradesh, said “some give and take is necessary” to solve the border dispute. “India will have to move away from our position that our territory is non-negotiable,” he told the media. Given Singh’s post as the head of a sensitive Indian state, he surely had clearance to speak from Delhi. Although a triangular strategic alliance is not imminent, the overlap of interests among China, Russia and India has grown, especially with the rise of the BRICS. “For Russia, the ‘strategic partnerships’ it is developing bilaterally with China and India constitute increasingly important components of its overall foreign policy,” adds Kuchins. What matters is in all three countries there is strong rhetorical support for a multipolar world order not dominated by the United States. In each country there is a convergence of interests on key issues such as Islamic terror; Western unilateral military actions to topple regimes; and ballistic missile defence. A stronger BRICS alliance is the perfect cure for the India-China deadlock. As a group the BRICS will have zero credibility if two of its leading members are tied down by border disputes. And a border clash would probably kill the alliance. 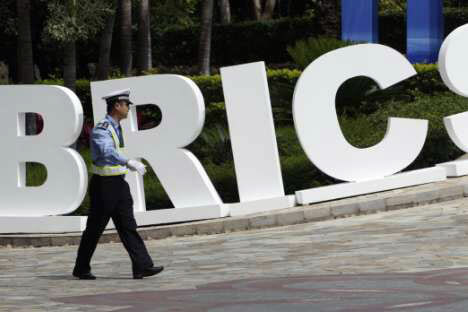 In fact, Western media outfits regularly play up the lack of integration – and potential for conflict – among the BRICS. Russian mediation through BRICS could be a game changer, and for that Putin will have to play honest broker. While cynics might say it is in Russia’s interests that China and India remain rivals so they keep buying armaments from Moscow, it is worth noting that NATO members also buy weapons from the United States without going at each other's throats. New Delhi must realise this border drama has played far too long. Unlike other disputes such as India vs Pakistan (grounded in religious hatred), Russia vs United States (clash of civilisations), Japan vs China (ancient enmity), or even Scotland vs England (mutual dislike), the India-China faceoff is contrived. The two neighbours were on friendly terms for thousands of years – unprecedented in human history – until the seeds of trouble were planted by the British. Besides, 50 years is a long time to carry a grudge.